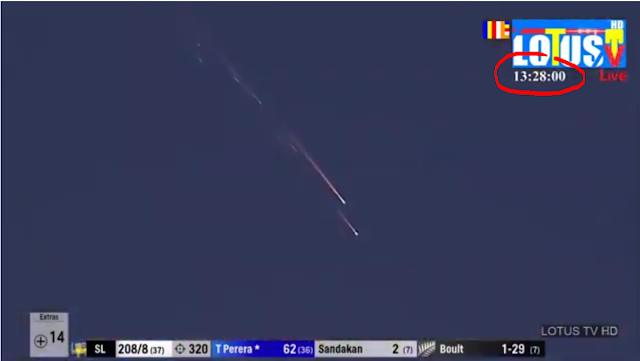 From the video footage, the event had a duration of at last 1 minute, and likely longer. The event was widely seen and reported from New Zealand: more images and more noteworthy video footage, as well as descriptions, can be found in this news article from the New Zealand Herald. From the footage it is clear that this is a space debris reentry: the event is too slow and of too long duration to be a meteoric fireball. CSpOC at the time of writing (5 Jan 2019 14h UT) has a reentry TIP for 6:41 ± 4 m UT on its webportal Space-Track. This is 1h 47m, or one revolution, earlier than the New Zealand sightings. Nevertheless, I am fully convinced that the event is Kosmos 2430 reentering - the match is too good, and the footage clearly suggests an artificial object reentering from earth orbit. So why the mismatch with the CSpOC TIP? 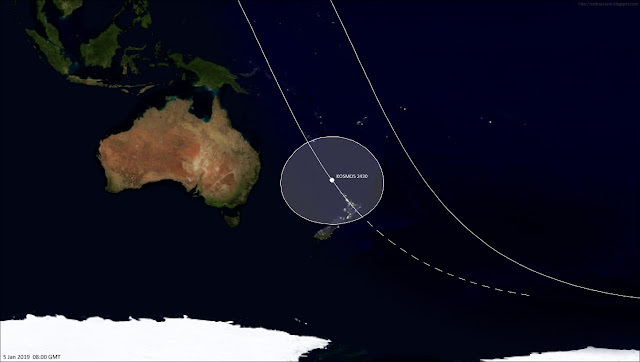 The perigee altitude already is very low, near 90-85 km altitude, for days before the reentry and changes minimally untill the actual moment of reentry. 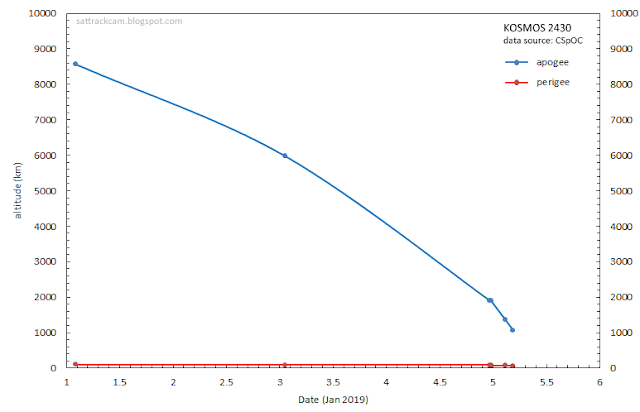 The difference between apogee and perigee altitude remains significant up to the last few revolutions, with apogee still at 1000 km only two revolutions before reentry. This means that, unlike typical objects reentering, Kosmos 2430 only briefly dipped into the upper atmosphere during each orbital revolution, experiencing drag only during brief moments. This is the kind of situation where an object can survive multiple very low perigee passes, and predicting the actual moment of reentry (i.e. during which perigee pass reentry will happen) is difficult. Looking at the CSpOC TIP bulletins for January 5th, this is clear as well as the CSpOC predictions significantly shifted forward in time with the addition of data from each new orbital revolution. The sightings from New Zealand strongly suggest Kosmos 2430 survived one orbital revolution longer compared to the current (final?) CSpOC TIP estimate. 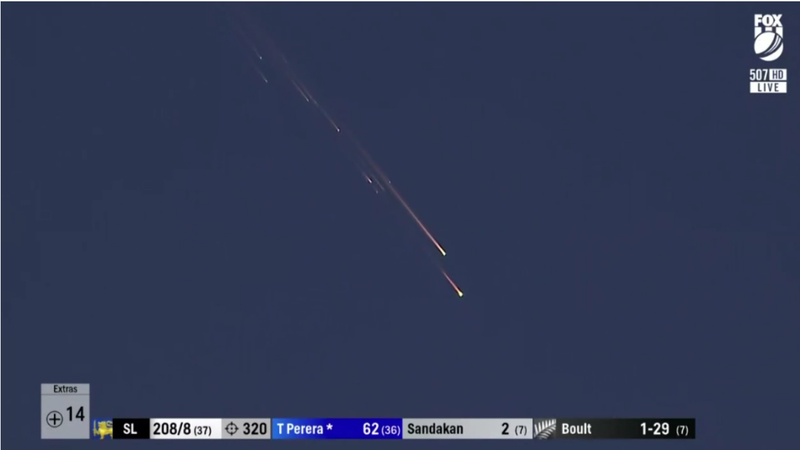 Note that with such brief but deep dives (well below 100 km) into the upper atmosphere, it is possible that the satellite already developed a plasma tail one or two perigee passes before actual reentry. The copious fragmentation visible in the footage from New Zealand shows that this event, at 7:58 UT was the actual moment of atmospheric reentry and complete disintegration. Fireball swarms from such entries occasionally are misperceived by some witnesses as bright lights on a single large object. I'd be interested in hearing about any such description from witnesses this time. I was among a dozen to twenty amateur astronomers setting up telescopes on a field at the Central Star Party near Hastings, Hawkes Bay, NZ, nearly 10 minutes after sunset (7.58 U.T.). Someone yelled, "Look to the north! We immediately saw a cluster of orange/yellow streamers with bright heads moving slowly south. There were initially seven or so before the numbers dropped down to just the brightest component. Given that the objects started at approx. 15 degrees above the horizon and situated in the north east in still light blue sky ( the darker Earth's shadow and the 'Belt of Venus,' the pinkish band that sits on the top of the Earth's shadow, were below the debris) in the first 15 - 20 seconds the brightest part may have been on a par with Venus at its brightest, i.e. Magnitude -4.4. There were several explosive out bursts that shed more, smaller bits before the object seemed to disappear at around due east. A few seconds later there was another, larger explosion that left an enduring smoke ring which remained visible for up to 20 minutes as a discrete spot about 20 arc minutes across. The magnitude at this time was closer to -7.0! If this had happened 90 minutes later when the sky was dark the object would have cast shadows! The object broke up into another group of 5 or 6 objects as it faded out in the SSW direction. At its greatest elevation the object was no higher than 20 degrees. We were fortunate to have the best seats in the house as we saw the whole event from side on and the object was always at a comfortable viewing height. The only down side was that none of us had cameras or even cell phones handy! In 45 years of active, amateur astronomy I have never seen anything like it, and I have seen a lot! Correction to my observation above. The object faded out in the SSE not in the SSW. Unknown, Where were you, and in what direction were you looking? How high in the sky (how many hand spans at arm's length) was the object? How bright was each object, e.g. as bright as the Full Moon, Quarter Moon, Crescent Moon, Venus, Jupiter, the brightest star? All of these things need to be known before anyone can answer your questions. That's very cool, Ian. I observed it from Ohiwa Beach at approximately 8.00 U.T. (but it could have been more like 7:55). It first appeared as a single object about 20 degrees above the horizon in the north. My first impression was that it might be a flare from out at sea. But it got bigger and more luminous. I thought it peaked at magnitude -6 or so before passing overhead and disappearing to the south. Its shape became sort of elongated and it appeared to fragment into at least two pieces. It might have lasted about 30 seconds or so but the trail remained visible for some time after that. Unfortunately, I didn't hear anything. At the time, I was certain it couldn't have been a meteor. So it's nice to be vindicated! Thanks Josh. It is good to see that our magnitude estimates are fairly close. We may have had a better view of the last explosive episode, but you caught it from the start. I get the feeling that the shredded object we saw was what the cricket cameras captured so well. I also suspect that the video cameras at the cricket are fairly long focal ratio affairs as they make the sky look quite dark compared to the short focal ratio, widefield cell phone cameras, some of which struggled to get contrast. We also saw another event nearly 1 hour and 15 minutes later (~22:15 local time) in the same area of the sky. We were camping between Oceans Beach & Kauri Mountain out Whangarei Heads. Directly out to sea from that location. It seems so weird that there would be a second event, albeit less spectacular. Scott, there was a lot of meteor activity on Saturday night. I observed through to 2.30am the next morning. The early evening saw plenty of satellites as well, which is normal. There was also a good pass of the ISS (International Space Station)in the north, mid evening. Quite a memorable night all round. World Best Astrologer Bharat Bharguvanshi Ji, One Call Change Your Life, Problem Solution Specialist. is the technique for decision for most clients, however. This is on the grounds that there are more open bearers out and about than some other and they can deal with most any vehicle. On the off chance that the vehicle you require delivered is one you drive day by day, open delivery is the best approach. It is quite often the least expensive approach to deliver a vehicle. s is the technique for decision for most clients, however. This is on the grounds that there are more open bearers out and about than some other and they can deal with most any vehicle. On the off chance that the vehicle you require delivered is one you drive day by day, open delivery is the best approach. It is quite often the least expensive approach to deliver a vehicle. I saw that on TV and further read about it on another blog named "Humax Direct Discount Codes" I couldn't actually believe that it was a fireball as it looks like a some kinda firework.